A collection of 15 1950-1956 Packards owned by a man who devoted much of his professional life to selling and repairing examples of the orphan car brand will be sold at auction next Saturday. Raymond Barland and two of his brothers founded a Packard dealership called University Motors in 1947. The family members continued selling and repairing Packards in the Lawrence, KS dealership for sometime after the car company officially folded in 1958. 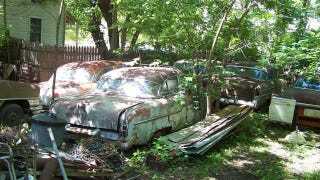 According to Hemmings.com, where we found this collection of Packard project cars, Barland sold Packard restoration parts into the late 1990s. All 15 Packards that will sell next weekend were on Barland's property in Lawrence when he died in 2004. They had remained there until the city discovered what was hiding behind the fences surrounding the property and began pressuring Barland's family to get rid of the cars. None of these Packards are super rare or desirable cars, and they are all certainly in need of some love. Even so this assembly of orphans deserve to be saved, at the very least to keep another Packard on the road or at best to be brought back to life themselves. If you're in the Midwest and in search of a Packard project, Lawrence, KS is the place to be next weekend. We can only hope each of these old cars falls into the hands of someone who is interested in using them for something more than scrap metal.